In a previous post, I shared the second photo from one of the photo viewers that were found in the pretty vintage box I found at my Mom's house. Today I'm sharing the third, and last, photo with you today. This photo was also taken using my cell phone. I held the photo viewer up to the light and then put my cell phone camera lens next to the viewer as if I were holding it up to my eye. I then took a photo of what my cell phone saw. 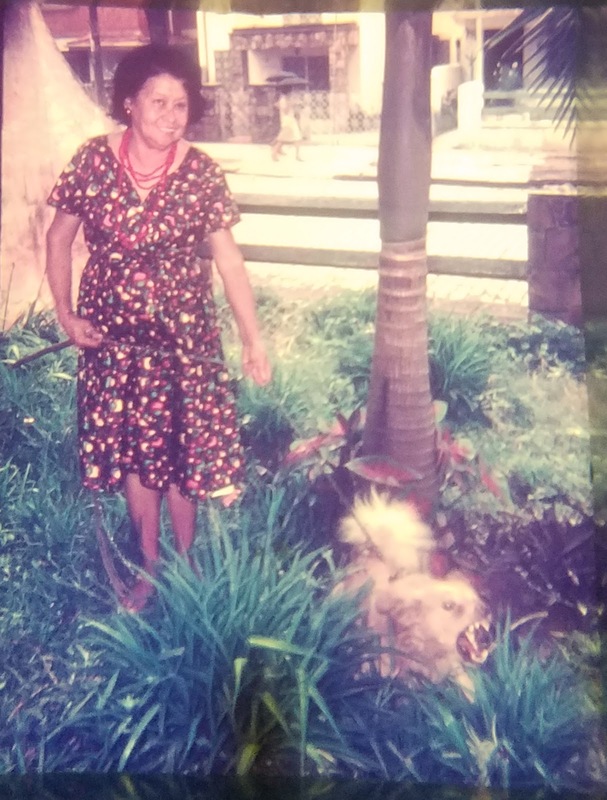 It looks like this is also a photo of my maternal great-grandaunt, Creceniana Aurora Matus Villatoro. In each of the three pictures from these vintage photo viewers, Crecenciana was accompanied by a dog. 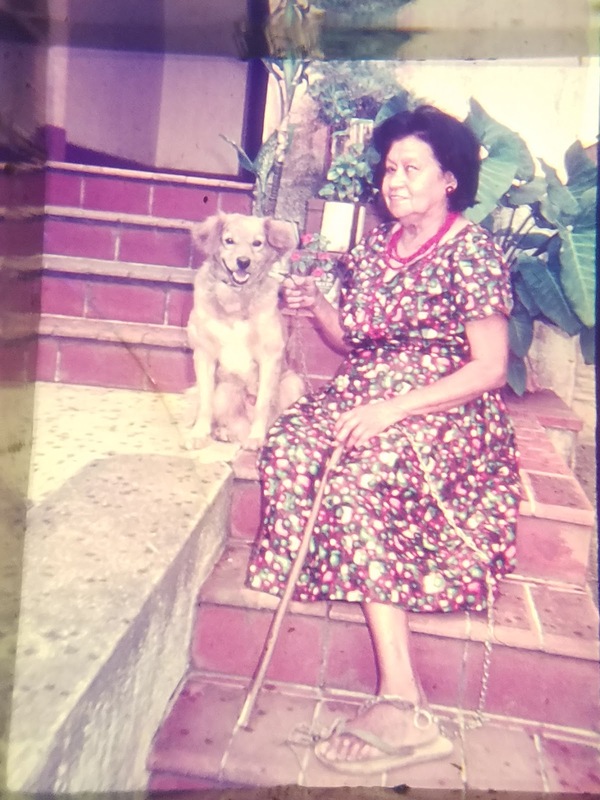 She loved dogs, according to my mom. I think Crecenciana was with the same dog in each photo. 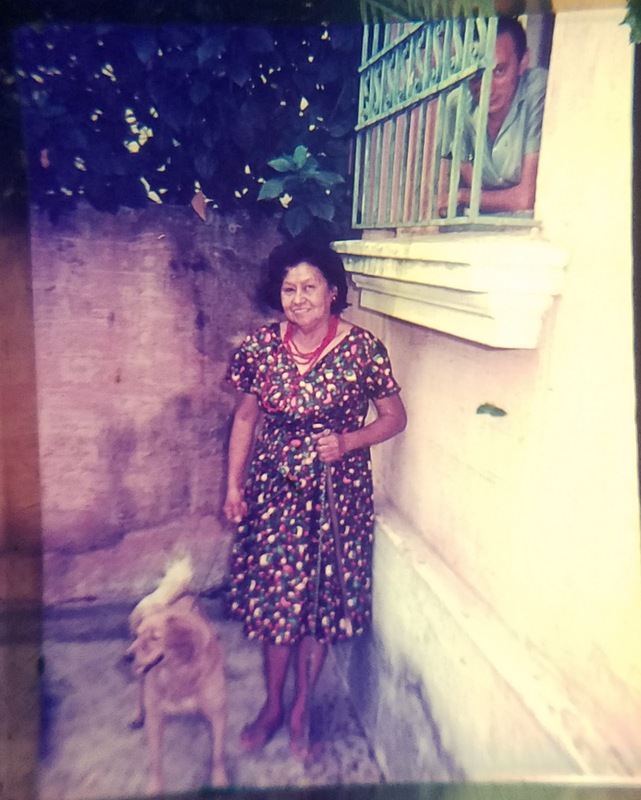 In the first two photos the dog looked calm, but in this photo the dog looks like it was snarling at something or somebody. Wow! It looks rather vicious, doesn't it? I wonder what was going on and why it was acting this way. Here are the first two photos for comparison. See how calm the dogs looked? Do they look like the same dog to you in all of the photos? Besides the snarling dog in the photo at the top of this post, do you see anything else of interest in the photo? I noticed the two people walking across the street near the top of the photo. I thought that was interesting. It looks like they are both holding umbrellas. I don't see any rain, so I'm assuming they are trying to shield themselves from the sun. Perhaps it was a hot summer day there. As with the other photos, I don't know when or where these were taken. But, it's quite likely they were taken in Brazil since Crecenciana immigrated to Brazil from Mexico. Well, that's it for the vintage photo viewers. There were only three of them in the pretty vintage box. But, there are lots of loose photos to share with you in upcoming posts. I never thought to hold the slide up and take a photo with my smart phone. Yikes! That dog looks some upset. At the same time, however, Crecenciana is smiling and looks unconcerned. Maybe the dog is just barking and the way the camera captured the image makes it appear to be snarling. I remember reading the first post in this series. Seeing the photo from the second post (with the man in the window) here had me checking out #2. Amazing shots of the photos, Jana. OMG, that dog is ANGRY! I agree it's the same dog, and it looks like the Cocker Spaniel mix I had as a child. I think my dog became just as vicious-looking at times. These are surprisingly good results. Nice job capturing these images. Thank you DiAnn! Yes, the dog does look angry, doesn't it? An intriguing photo technique! I am always struck by the name of your great, grand aunt - it roles off the tongue so wonderfully and at least you won’t have the problem of finding many researching the same combination of Christian and surname. Her name really is pretty and roles off the tongue so wonderfully. Thank you so much Sue! Great idea to use your phone to photo these photos from the viewer! Since your great grand-aunt is smiling throughout, I image the dog isn't really snarling, just in the midst of barking. Anyway, loved what came out of the vintage box. Thank you Marian! Yes, perhaps the camera caught the dog at just the right moment when it was barking that made it look like it was snarling. What a great idea! I have one of those from 1963 when my parents visited me at camp and stayed in some hotel nearby where they took those photos and made viewers. They left it with me at camp so that I would be less homesick. I treasure it, but never knew how to get the picture out! Now I can. Thank you!! Just wanted to let you know that I was able to get a great photo from the little viewer. I am so grateful that you taught me this trick as I now have a great photo of my parents from 55 years ago. Thank you! Lovely photos, thank you, Jana. Technology wins again! Love your cell phone/vintage photos--especially the snarling dog. Great photo of the dog in action... hard to get in those days! I go with excited to see someone.